The Federal Government says it has earmarked N10 billion for the reconstruction of homes destroyed by militia herdsmen in Benue and other states of the federation. Vice President Yemi Osinbajo disclosed this yesterday during a tour of Internally Displaced Persons Camps, IDPs in Benue State. He said President Muhammadu Buhari had directed provision of security in deserted homes, villages and towns for the people to return, construction of destroyed homes and restoration of the displaced to their farms and businesses. Professor Osinbajo directed the National Emergency Management Agency, NEMA to immediately provide tents at the IDP camps to avoid situations where the displaced stay under rains. He commended Governor Samuel Ortom for effectively managing the humanitarian crisis in the state, stressing that it was the duty of the Federal Government to support the state towards alleviating the sufferings of the displaced. 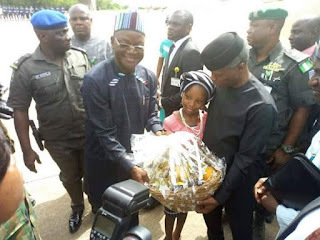 Governor Ortom who thanked the Vice President for visiting the affected persons in the camps, appealed to the Federal Government to ensure the return of the displaced to their ancestral homes. He appreciated President Buhari for the deployment of combined special security forces to contain the attacks on Benue communities by militia herdsmen, expressing the hope that the visit of the Vice President would restore peace in the state. In separate remarks, Chairmen of the IDP camps at Abagena and Daudu, Messrs Philip Usaaku and Francis Shiva, as well as other displaced persons, appealed to the Federal Government to hasten their return to their homes, even as they noted that the Governor had done much for them in the camps.